If you’ve seen the MediaSmart Server in retail stores, you’ve likely seen the demo units that are created to show off the sleek form factor and soothing blue glow of the server. These demo units are stripped down to pretty much just a shell with a power supply and LEDs. The motherboard is in the unit but there are only enough components soldered on to power the LEDs and give the false appearance of functionality. 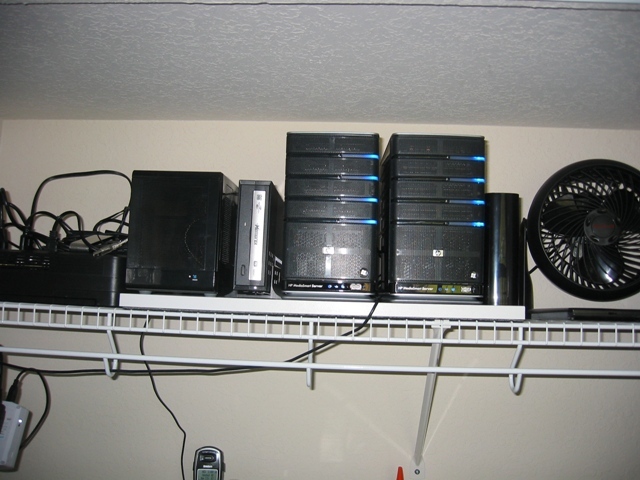 Long time forum member “erail” has today shared with us his creation, an eSATA storage enclosure that looks like the identical twin of the MediaSmart Server. He built the enclosure out of a demo unit, modified some HP 9000 SCSI drive trays, and borrowed the backplane from a donor enclosure. Read all about how erail built the enclosure and check out a bunch more pics in this forum topic. Thanks, erail, for sharing your creation with us!